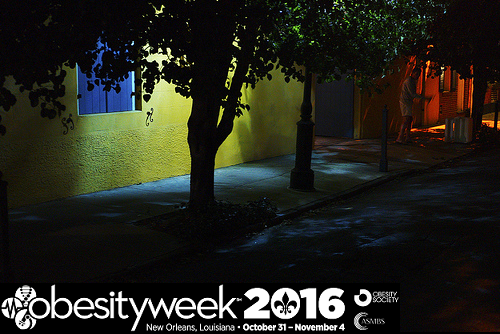 ObesityWeek 2016 in New Orleans is barely a week away. ASMBS and the Obesity Society (TOS) have wedged an incredible wealth of new information into this short week. Sorting through the options is already a challenge and program information just keeps coming. More than a thousand research abstracts will be presented. National Obesity Care Week. This campaign calls healthcare professionals to Take 5 – five minutes for a respectful conversation about obesity to support patients and provide better care. TOS President Penny Gordon-Larsen will recognize Senator Bill Cassidy, Senator Tom Carper, and OAC President Joe Nadglowski for their leadership in advocating for obesity care. ASMBS will present an Access to Care Symposium on Wednesday at 4:15. Thursday at 3:45 pm, six presentations of important new research on Healthcare Policy and Treatment Barriers will bring the subject into focus. Keynote Events. Sadaf Farooqi, a renowned expert on obesity genetics, will open TOS scientific sessions on Wednesday morning at 8 am. She will bring a cutting edge perspective on the neuroscience and physiology that regulates energy balance. Later on Wednesday, Kelly Brownell will deliver the Integrated Health Keynote Lecture on nutrition and public policy. Then on Friday, ASMBS and TOS will combine forces to present a keynote discussion on Surgery, Weight Regain and Weight Loss. Journal Symposium. The Obesity Journal Symposium will mark its fourth year with the presentation of five groundbreaking papers that run the gamut from basic science to clinical care to population health and health policy. You can expect intense media interest in NIH research that quantifies the physiologic role of appetite to limit on weight loss. Tuesday Forums. These forums will present important new perspective on emerging drugs and devices for obesity and on regulation and safety of dietary supplements. Key Lectures come throughout the week, focusing on the microbiome (also here), school nutrition policy, food policy, neuroscience, clinical care, mobile technology, and more. Wednesday Policy Forums. For people who are immersed in the subject of obesity prevention policy, Wednesday afternoon will be a marathon. A symposium on food marketing will be followed by another focusing on case studies of promising policies for obesity prevention. These six highlights are really just a small taste of what’s available at ObesityWeek. Start planning now, or you’ll be kicking yourself later. The schedule is here and the mobile app is here.